The Cuban Government is tightening its control over internet access. A new law coming into force on Saturday makes it impossible for many Cubans to dial up the internet from their home telephone lines. The move has been criticised by the human rights group Amnesty International. Cuba says that, given its limited resources, it needs to ensure that the internet is primarily used for the social good. 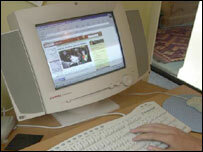 The move clamps down on the thousands of Cubans who illegally access the internet from their homes. From now on, it will not be possible to dial up the main government server from most domestic phone lines. Only lines which are paid for in dollars will have direct access. These are usually restricted to foreigners. Amnesty International says this is an attempt to shield Cubans from alternative views. All news media in Cuba is rigorously state-controlled and supportive of Fidel Castro's government. But the Cuban government has reacted angrily to suggestions that the change amounts to censorship. It says it is doing nothing more than preventing overused internet connections being clogged up by people borrowing, or selling each other passwords. The internet should be for the common good, it says, pointing out that it will still be available in schools and workplaces. Dissident groups have expressed doubt that the authorities here can control the internet as much as they might wish. It is true that whenever a new law comes into effect here, Cubans - who are famed for their inventiveness - tend to find a way around it.